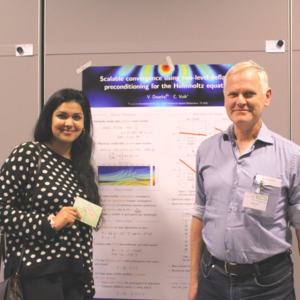 Vandana Dwarka has won the first poster prize with the title “Scalable convergence using two-level deflation preconditioning for the Helmholtz equation”. The Helmholtz equation is used to describe various wave phenomena with a mathematical model. Applications are: waves in an harbour, seismic for CO2 sequestration, understanding earthquakes, medical imaging and many more. The problem is that looking for more and more details, the problem becomes harder and harder to solve. Vandana has developed a method that makes it possible to approximate the solution of the Helmholtz equation in an efficient way, also for high accuracy applications. 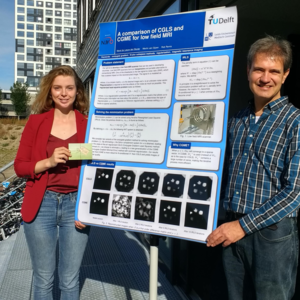 Merel de Leeuw den Bouter has won the third prize with the title “A comparison of CGLS and CGME for low field MRI”. Merel is a member of a team that is developing affordable MRI scanning machines to be used in developing countries (Uganda in this project). The key idea is to do many measurements with low intensity magnetic fields, in order to keep the costs low. However, the results contain a lot of noise. After combining the measurements together with various numerical methods it appears to be possible to achieve a high accuracy also by using these noisy measurements. The Woudschoten Conference goal is the transfer of knowledge. It provided an introduction to an overview of groundbreaking developments in scientific computing and numerical analysis. The conference is attended by essentially all Dutch and Flemish researchers in numerical analysis and scientific computing, from Ph.D. students to full professors, and including industrial researchers.